During an inspection of the Muscat Lunch Bar Restaurant, 24 Ta’as Street, Kfar Saba, unidentified lamb fat was discovered. After questioning those in charge, inspectors learned the lamb fat was not kosher. As a result, the eatery’s kashrut certification was immediately revoked. 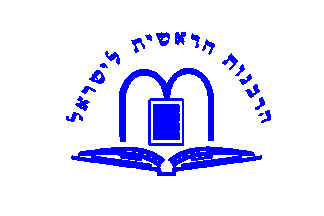 An inspection of Gush Dan area grocery stores turned up the product labeled “Nes L’café – Home Baked Goods” (barcode 7290001459096), with the label stating under the supervision of the Yavne Rabbinate and Mehadrin Chug Chatam Sofer Bnei Brak. The certification claims are bogus. (See photo 3 on the right side of the Hebrew original below to identify the product label). 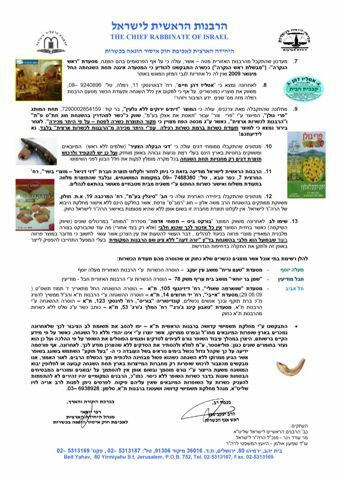 An inspection conducted by Chief Rabbinate officials of the herbs and vegetables labeled as ‘insect-free’ ‘shomer shabbos factory’ under the label Tavlinim Yeruchim (phone 050-835-6863) does not have any supervision from the Chief Rabbinate and it should not be used. (See photo number 4 on the left side of the Hebrew original document below to identify the label). The Haifa Rabbinate reports a firm called Absrect Catering (052-640-2264) is advertising itself as kosher under the supervision of the Haifa Rabbinate. The firm exhibits a photocopied kosher certificate at times. In actuality, it does not have any kashrut supervision from the Haifa Rabbinate and one may not hold a wedding in the caterer’s facility. The restaurant, also advertising itself as Mevashelet Rosh HaNikra, is not under the rabbinate’s supervision as of January 2009. Young Bakala Fish sold whole without heads are extremely insect/bug infested. Consumers are urged to only purchase fish with a reliable kashrut hechsher. The Chief Rabbinate reports Danny Daniel meat products are once again approved, adding consumers and retailers should only buy products bearing kashrut certification and accompanied by appropriate shipping documentation. 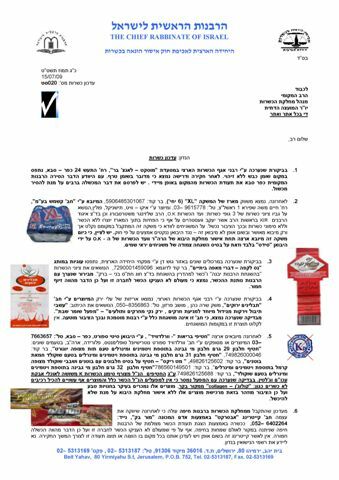 Candies distributed by Sijlin LTD )19 HaMerkava Street, Holon industrial area), are marked under the supervision of Chug Rambam, France, is being imported without authorization from the Chief Rabbinate and therefore, the product should not be used. HaMutag Potato Burekas Bis found in Rami Levy HaShikma supermarkets does not make any mention of being dairy on the front, only on the rear of the product. In addition, they are the standard rectangular shape, associated with the parve burekas. 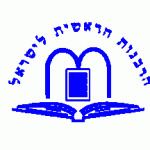 The product does not bear a local rabbinate supervision, but does state Yoreh Deah – Rav Machpud. Due to the fact the product does not conform with standard kashrut regarding the shape and it being dairy, the factory has committed to immediately halt the current production line and make necessary adjustments to avoid misleading consumers. Taboon King George Restaurant – 53 King George St. – advertises as kosher but does not have Tel Aviv Rabbinate supervision. Following is a notification is being published on behalf of the Tel Aviv Judaica supervision officials. Of late, many shofarot are being imported, primarily from Morocco, manufactured by non-Jews, without kosher supervision. During the manufacture, some of the shofarot are cracked or damaged, and substances are used to repair the damage and while this may not be visible, they are not kosher for performing the mitzvah. The public is urged to only purchase shofarot with a kashrut supervision. Rabbonim are also asked not to grant supervision to any shofarot if they are not totally familiar with the manufacture process. For additional information, one may call Rav Aryeh Levine Shlita, who heads the Tel Aviv Judaica and Shatnez Division (03-693-8928). Posted on July 19, 2009 by JKN Israel. This entry was posted in 5769 - 2008/2009, Chief Rabbinate Updates. Bookmark the permalink.